We all have been waiting for this!! And now that iPhone 4 jailbreak has been released to public, the much awaited update to My3G app has been released !! 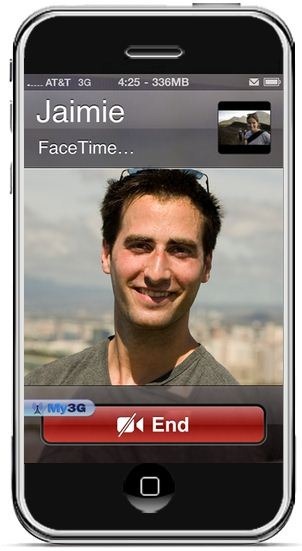 With this new updated version of My3G for iPhone 4, you can now make FaceTime video calls over your cellular 3G network which otherwise isn’t possible. This in my opinion is a killer app and will alone be worth jailbreaking your iPhone 4 for. Official description of the app is as follows. – Ability to select which apps are My3G enabled and not. – Default Apps – no configuration for the most popular apps! – Dynamic enablement – Higher successs rate (near 100%) then 3G Unrestrictor (which does one off solutions for apps). My3G enables 3G indicators more dynamically. You will of course need a jailbroken iPhone to get it installed. Follow our complete step by step guide posted here to jailbreak iPhone 4 on iOS 4.0.1 / 4.0 using JailbreakMe 2.0. Once you are done with the jailbreak, goto Cydia, search for “My3G” app and install it. My3G will also install “RockApp” as a part of its package. My3G for iPhone 4 is available on RockApp fo USD $3.99 and is worth every penny of yours! I never understood why My3G requires RockApp. Cheap marketing in my opinion. While awesome, that is a great way to rinse your data allowance if you aren't on an unlimited plan. Be warned! I don't get why we can't just buy it through cydia instead of having to download and buy it through Rock. They'd get their money either way. will it work in canada on rogers? We want it available for FREE! Isn't it? ok I brought it, no instructions on how to use it! call me blonde if ya want but I can't figure out how to start it. Maybe I should put down the bottle of rum first! can someone explain how it works. thanks. I did install My3G and it did work. But for some reason, later this eve, it stopped working. I thought it was just my phone. But My friend who also installed it, had the same problem. We both used facetime on 3g earlier today. I wonder what happened. Rock offers a 10 day trial to try for free… thats the difference. Downlaoded it. It worked but didn't install an icon or anything. Apps just used 3g. It stopped working. Downloaded again and got it plus ROCK. Rock wanted a registration plus 3.99 to use my3g. Uninstalled both and then saearched cydia gain. This time I downloaded my3g from macosmovil instead of modmyi. This time I had an icon, options for what progs it worked with and it works great. Go to the list of apps. There is an arrow to the right of the green checkmark that is placed next to the enabled apps. Click on the arrow and turn on the flag. It will work. My facetime works off of wifi. Now my facetime wont activate. Tried resetting networks settings than all settings. Still wont activate… keeps saying “Activation Unsuccessful. Turn on facetime to try again.” Ive turned on and off several times and tried everything. I have wifi turned on and it still wont activate. Have my3G installed and have tried everything. Please help. I'm not that dumb… Like I said, it doesn't work. Tried uninstalling and re-installing too… Still doesn't work. If anybody can get this to work on iOS 4.0.1 I would be surprised. Go into my 3G and next to the green check you will see a blue arrow > . Click on the arrow. You will see a where it says “Use Direct Flag”. Turn that on. Your facetime will work.